In just several weeks of working with Jeff, I changed how I walked, sat, stood up, balanced, and stabilized myself. As a result of this work, I avoided surgery and was able to go off on a 110-mile backpacking trip with my son. Whether overcoming injury, improving the activities you enjoy, or just feeling more comfortable in your own skin— most people want to improve the quality of their lives. 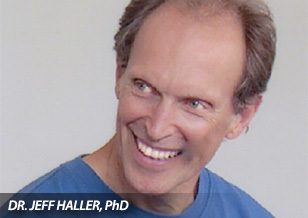 Working with Jeff Haller can help you develop better functional support from your body, move with greater agility, be more efficient in action, and significantly reduce the stress and tension you have lived with. By developing a refined awareness of your self through simple movement practices, you can open the doorway to improve the quality of your life. Inside Moves’ unique movement lessons and training by Jeff Haller are based upon the proven Feldenkrais Method® of Somatic Education pioneered by Israeli physicist and martial arts black belt, Dr. Moshe Feldenkrais.